Place your burgundy satin centered in the 6" embroidery hoop. Center the angel applique. With needle and white thread tack it down all around the edges. Near the outer edge of the fabric, just inside the hoop, make a ring of Japanese Ribbon stitches in pairs one facing toward the center, the other facing toward the outside of the hoop. See diagram for stitch. Spaced in the ring of Japanese Ribbon stitched leaves make large individual French Knots using the white Organza ribbon. See diagram for stitch. 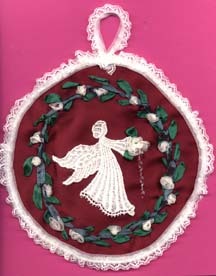 In the angels' hand make a single rose or a grouping of French Knots and two leaves. With double thread stitch the loop at the top of the icicle under the edge of the flower in the angels' hand. Remove from hoop and touch up the crease left by the hoop with a warm iron if necessary. Cut your plastic in a circle just larger than the ring of leaves on your design. Cut the felt just slightly larger than the plastic. Fold the burgundy satin around the plastic and tack in place with either hot or craft glue. When dry trim back the satin. Glue or stitch your lace or trim to the back of the ornament so it protrudes and can be seen from the front. Position the felt to cover the back and the edge of the lace and either stitch or glue in place. Turning the ornament face up stitch or glue a loop of trim or ribbon to the top as a hanger. These beautiful icicles come in different sizes as well as a matched set for pierced ears with sterling or gold filled hooks. Also available are icicles fused with cobalt blue glass and blown clear glass globes that have tiny holes for inserting silk ribbon or beads for additional ornamentation.